Turbine USA was the vision of a seasoned international chef, who wanted to create a line of kitchen tools that are as functional as they are elegant. ​We identified that the construction on most knives, even high price point knives have a major flaw; that is the three piece handle construction will eventually degrade or break . So we designed a set of knives using all the essential “touch points” needed in a professional knife, whilst removing everything else. The result: a single cast knife of exceptional quality. The wooden block is designed to be fully functional, but also adds features not seen in any other blocks. 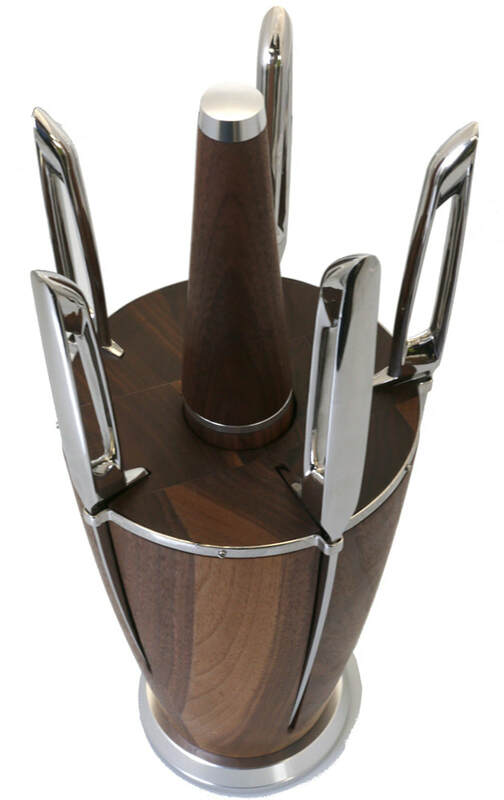 The fusion of the walnut and stainless steel presents the product as a beautifully functional knife set. Ready to compliment your culinary work space.